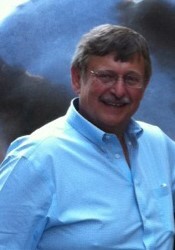 Mr. John D. Caveny is Co-Founder and President of Environmentally Correct Concepts, Inc., (ECCI™). Executive, farmer and landowner with over 40 years of practical experience in growing grass for feed and fuel, Mr. Caveny began development of practical climate change mitigation strategies using agriculture and forestry activities in 1996. He developed the technology to measure carbon that is removed from the air and stored (sequestered) by terrestrial plants grown for food, fiber and renewable fuel. In July 1997, the Illinois Corporation was the first to patent the only climate change mitigation technology based on the fact that atmospheric CO2 is the only source of carbon for use by green, growing terrestrial plants in an essential process called photosynthesis. In 1998 ECCI's™ business began. ECCI's™ is first in the field for its ability to provide carbon accounting for sequestered carbon in herbaceous plants. The result being ECCI™ Real Carbon Credits, each credit representing one ton of CO2 removed from the environment..
Mr. Caveny earned his MS degree from the University of Illinois at Urbana-Champaign in 1973. Mr. Robert L. Conley is a Co-Founder of Environmentally Correct Concepts, Inc., (ECCI™). As a native of Hillsboro, Kentucky, Mr. Conley began to develop his interest and passion for the cattle industry. Mr. Conley attended the University of Kentucky College of Agriculture with a focus in the Animal Science and Agriculture Business. Throughout his time at the University, Mr. Conley founded his livestock brokerage company, Robert L. Conley Livestock. In conjunction with the continued growth of the livestock business, Mr. Conley founded a livestock transportation company that ships cattle across the country. Mr. Conley has served on state and national cattlemen’s committees, he is the past President of the Kentucky Livestock Marketing Association, and is an active sponsor of the Kentucky State FFA. Throughout the growth of his companies and involvement in local and national organizations, Mr. Conley has remained true to his roots as a cattle farmer in Central Kentucky and an advocate for agriculture nationwide. Dr. Emily Heaton is an Associate Professor of Agronomy at Iowa State University. In her Biomass Crop Production and Physiology lab they specifically investigate how biomass crops influence, and are influenced by, the environment through key physiological processes like photosynthesis, biomass accumulation, water use and nutrient cycling. Dr. Heaton collaborates in the NIFA Coordinated Agriculture Project CenUSA and the DOE Regional Feedstock Partnership, and has also served as Bioenergy Systems Community Leader in the American Society of Agronomy. Her program collaborates closely with the University of Iowa's Biomass Fuel Project and the Iowa State University STRIPS project. Dr. Heaton earned her BS, PhD, degree in Crop Science from the University of Illinois at Urbana-Champaign in 2006. Dr Smith's research interests are in the physiological responses of crop plants to increasing atmospheric CO2 levels and to climate change, plant-microbe signaling and biochar effects on crop productivity. His research activity has resulted in over 320 publications which have been cited almost 10,000 times, 12 patents issued, a spin-off company (Bios Agriculture Inc.) and products applied to tens of millions of cropland acres each year. He currently leads the NCE funded ($10 million per year) BioFuelNet Canada Network (http://www.biofuelnet.ca) on development of advanced biofuels, including conversion of waste biomass into fuels, and also heads the McGill Network for Innovation in Biofuels and Bioproducts (http://mcnibb.mcgill.ca/index.html) and the Eastern Canadian Oilseed Development Initiative network (AAFC funded at $2 million per year). He has had international collaborations with the US, India, China, Russia, Brazil and Africa and has collaborated extensively with industry as part of his research activities. Paul has over 20 years' experience of the development and commercialization of energy grasses throughout North America and Europe and more recently in South America. After completing his Doctorate, on the physiology and production of Miscanthus, Paul worked for a number of years in Government funded research into energy crops. In 2000 he entered the commercial renewable energy market and became involved in both crop research and the commercial introduction of energy crops, from grower level right through to end-user supply contract negotiation. In 2009 Paul created New Energy Farms with Dean Tiessen, both of them sharing the vision that the slow progress in market penetration of biomass renewable energy cropping could be overcome, in the first instance, by addressing the costs and efficiencies of establishing the crops. Their vision developed the technology behind CEEDSTM. Paul is based in the UK, at the NEF Marlborough office in Wiltshire, but also visits North and South America on a very regular basis.